Fine needle aspiration (FNA) cytology is a useful technique for diagnosis of palpable and mammographically detectable breast lesions. 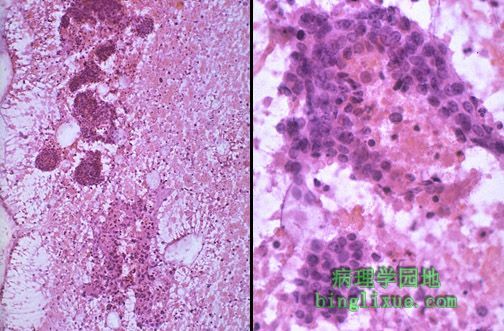 Seen on the left at low magnification are discohesive clusters of cells; on the right at high magnification the atypical nuclei characteristic for a carcinoma are present. 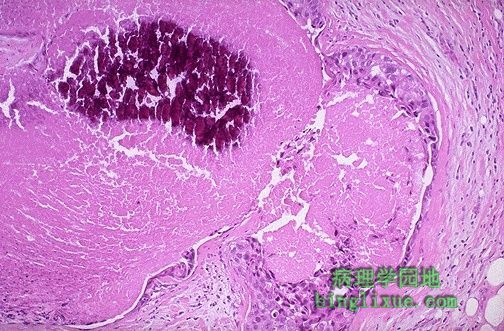 This high power microscopic view demonstrates intraductal carcinoma. Neoplastic cells are still within the ductules and have not broken through into the stroma. Note that the two large lobules in the center contain microcalcifications. Such microcalcifications can appear on mammography. 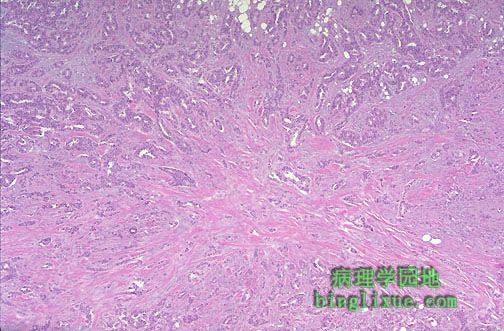 The classic cribriform pattern of intraductal carcinoma of the breast is shown here. 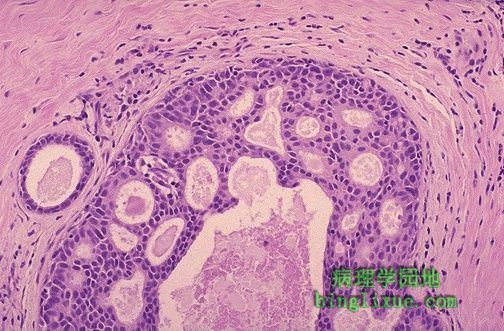 The neoplastic epithelial cells within the duct show minimal hyperchromatism and pleomorphism, but they have holes with sharp margins as though punched out by a cookie cutter. 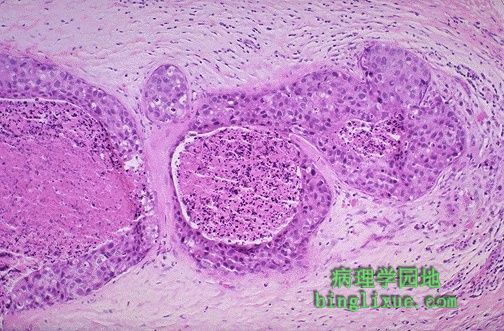 Here is a comedocarcinoma pattern of intraductal carcinoma, which is characterized by the presence of rapidly proliferating, high-grade malignant cells. Note the prominent central necrosis in the ducts. The cells in the center of the ducts with comedocarcinoma are often necrotic and calcify, as shown here. This central necrosis leads to the gross characteristic of extrusion of cheesy material from the ducts with pressure (comedone-like). 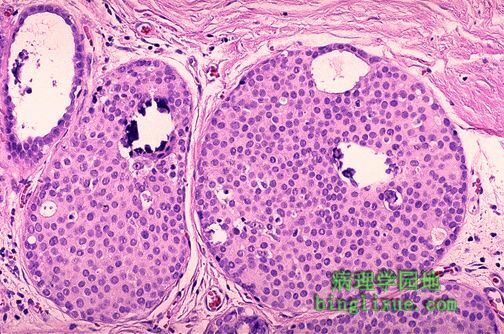 This is infiltrating ductal carcinoma of breast. Note the infiltration of ill-defined glands into the surrounding collagenous stroma. There is also a small microcalcification at the lower right of center, a finding that could be seen by mammography. About 65 to 80% of breast cancers are of this type. Both intraductal and infiltrating ductal carcinoma are seen here. Note the intraductal component in the center with cribriform pattern and prominent microcalcifications. Surrounding this are infiltrating carcinoma cells. This infiltrating ductal carcinoma of breast at low magnification appears to radiate from a central area of desmoplasia. This collagenous component gives the neoplasm a hard "scirrhous" consistency that is palpable. Such an invasive carcinoma may be fixed to underlying chest wall, making it non-mobile. 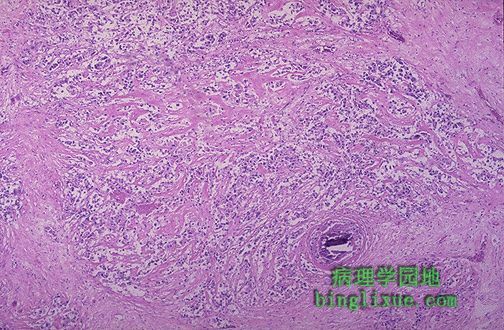 Note the small nests and infiltrating strands of neoplastic cells with prominent bands of collagen between them in this ductal carcinoma of the breast. 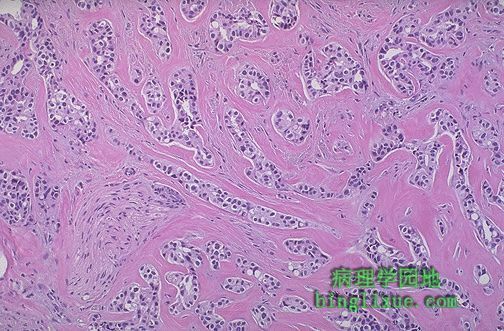 It is this marked increase in the dense fibrous tissue stroma that produces the characteristic hard "scirrhous" appearance of the typical infiltrating ductal carcinoma. Note the nerve surrounded by the neoplasm at the lower left. 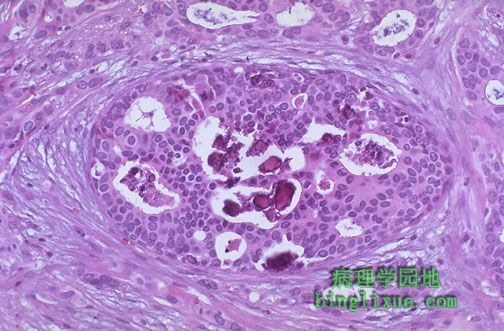 In the center is a duct lined by carcinoma cells. 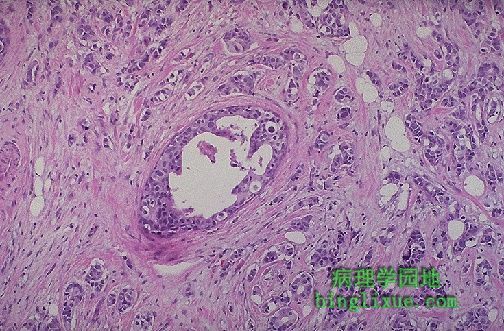 However, this ductal carcinoma is not confined to just the duct, but infiltrates outward into the surrounding stroma as an infiltrating ductal carcinoma.